One of the great things about running a website is the acquaintances it brings about. Generally these are email-only, but every once in a while I meet the individual behind the correspondence. So it was that on Tuesday, I flew up to Biddeford Airport in Maine to introduce myself and Zero Six Hotel to Leah Jones, who once helped build Piper Cubs at Lock Haven. 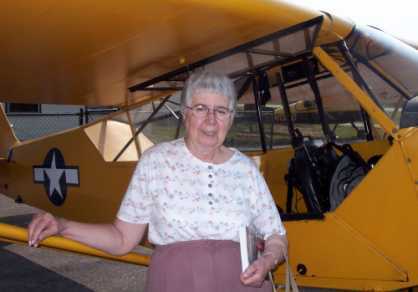 Leah made her first airplane flight in 1939 at the age of thirteen. (The plane was an Aeronca Champ, but we won't hold that against her.) The place was Suffolk Airport on Long Island--more of a sand field than a turf one, she explains. Nor was there a runway: you just took off and landed into the wind. Then came World War II, and civilian traffic in the New York area was grounded. So Leah wasn't able to solo at sixteen, as she had hoped and planned. That great moment was deferred to August 8, 1946, and the airplane of course was a J-3 Cub. That same night, Leah (she was then called Mae) took the train to Lock Haven, Pennsylvania, and the very next day she went to work at Piper Aircraft as a cost accountant. "I started screaming, 'I didn't come out here to fly a desk'," she says, and Piper obediently put her on the second shift as a time keeper. "I'd work till midnight," she recalls, "then go home and get four or five hours sleep, and out to the airport for flying." As a member of the company's Cub Club, she could rent a J-3 for $2 an hour. "The instructor was another fifty cents or so, depending on who I had," she says. One of Leah's great memories is the night they worked overtime so as to turn out 35 Piper Cubs in one day, a plant record. "Of course we were sowing the seeds of our own demise," she says. 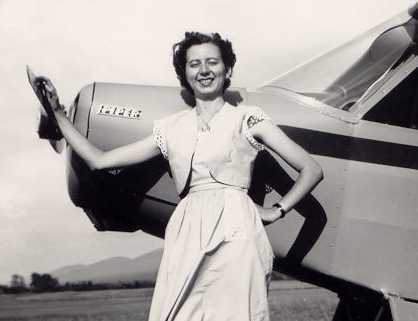 The market was soon flooded with lightplanes, and Leah was laid off on August 4, 1947. "It didn't last very long," she says now, "but it seemed like ages." The interview didn't last long, either, because I was due back to Hampton by 11 a.m. I propped Zero Six Hotel and jumped in. Leah pulled the right chock, her son pulled the left chock, and I headed off, happy as could be. It was a splendid flight up to Biddeford, and it was a privilege to meet one of the original Piper crew.